There are 4 places that I'd like to split my life between, aside from others where I'd still enjoy visiting. Only one is in the States, San Diego. But I could spend the rest of my time just bouncing between Paris, where I want to spend big gobs of uninterrupted time; Bath, where I just want to go about my everyday life surrounded by that fabulous city; and London, where I never get tired of just walking around and looking, hanging out in pubs or taking advantage of the multitude of entertainment offerings. Goes without saying that San Diego gets the winter months, But the other three seasons will be in constant rotation between London, Bath and Paris. That is not only my fantasy, those are my goals. so hard for Bath. But that is due to my extremely poor photographic skills, not to any lack in the city. I think a lot of people believe it would have been so cool to live in much earlier times if it wasn't for, you know, the conveniences. 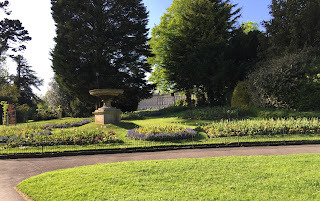 Well, Bath is pretty much intact, and so it feels like you are living in a very elegant time but with all the advantages of modern plumbing and technology. I do so love it there. A big part of why I love Bath is the architecture. The whole town is designated as a World Heritage site because it has been kept intact since it was built, during the Georgian era, one of the most elegant periods in history. It's just flat out gorgeous and/or impressive almost everywhere you turn. No less fascinating are the parts which are even older. The Abbey is another amazing church, both inside and out. And the structure, as it exists now, is from the 16th century. The areas on two sides of it are wide open squares, and are always full of activity. One of the main attractions of the city is the Roman Baths, a complex which began with a temple that was constructed in 60-70 AD. I love the way the Romans built this entire fabulous community center, basically, around a hot spring they found. It was on multiple levels and, according to this model they have set up on the property, it had all kinds of functional areas. But what I love best is that they figured out a way to turn that hot spring into pools, and surrounded it with gorgeous buildings. Aside from the Abbey and the Baths, though, most of the rest of the city is from the 1700s. And I love all of it. The big terraced rows made from pretty Bath stone. And the rougher stone buildings, which have a charm of their own. 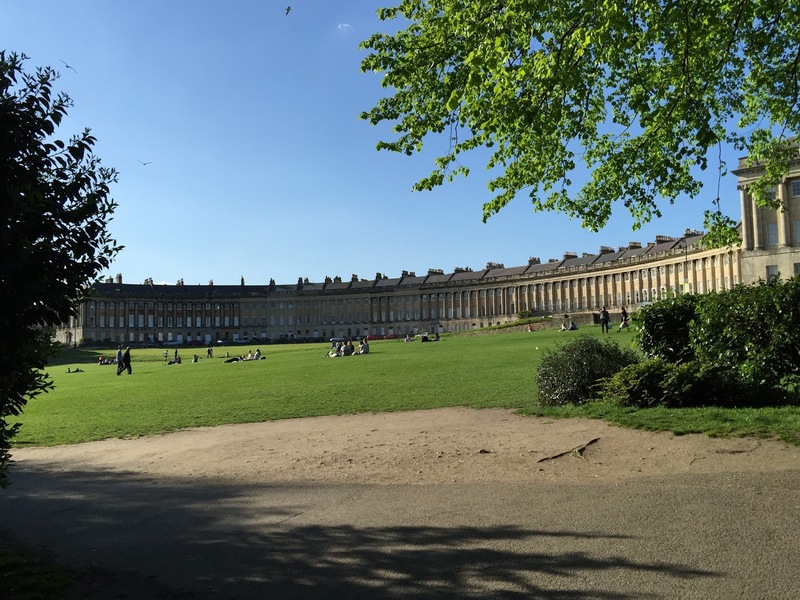 There is the Royal Crescent, which is is the very upper level of residences here. You can also see it peeking out from behind the trees in this photo of the beautiful gardens across from it. Then there is the Circus, slightly smaller terraced homes, set in a circle around a small park. side of the River Avon, there are more beautiful terraces of homes. And look at the size of those sidewalks! The city is super hilly in places, it's a real workout to walk around some of it. But it makes for some great views. What I didn't realize, though, was that the hostel where I stayed could be approached from two different directions. The one I used when I first arrived with my luggage. it was time to leave with my luggage. It's a very wide open city, the main streets are so big. And there are a some really nice pedestrian areas. A nice covered shopping area, too, that has been around for a very long time. I didn't see many horse and buggies out and about. Only this one, which had a pair of horses, instead just one. Now that's the real deal, because driving a pair is far more complicated than driving just one. Anyone who has read historical novels set during the seventeen and eighteen hundreds may be familiar with the Assembly Rooms. This is where elegant society gathered in Bath, for concerts and dancing, or other forms of entertainment. They are still being used today, there was a wedding held there the weekend I was in town. But it was so wonderful to be seeing all of these things that I'd only read about for so many years. I also went to take a look at the Fashion Museum they've established in the basement of this building. There are excellent examples of fashions from the period when Bath was at the peak of its popularity, but also from other periods. I finally got to see what muslins looked like. A vast majority of the exhibits were from earlier times, but they had some nice examples of early twentieth century dresses. I also liked this outfit from the forties. I'd wear that today. There was a Calvin Klein dress from 1991 I really liked. And one from Sarah Burton for Alexander McQueen from the 2011-2012 collection that could have been worn any time since the sixties and not been out of place. There are clothes available for adults and children to try on, as well as a backdrop for photo ops. Definitely bringing the kids here when they come next month. I also went to the theater while I was there, which was an experience I enjoyed immensely. It was a modern English murder mystery, I had a perfect seat - right in the middle of row H, and two really nice women to talk to before the show and during intermission. It was a great night. I love just being in this city. I want to come back. And stay.